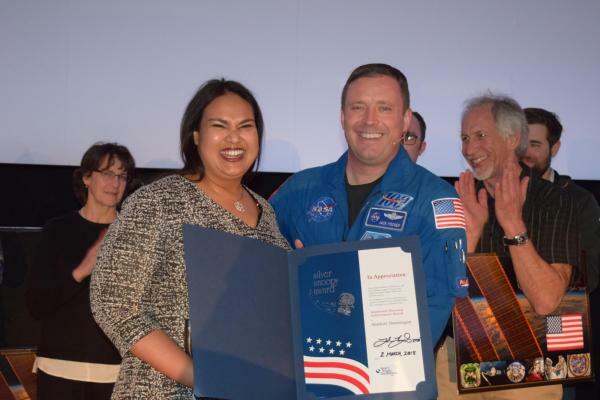 March 6, 2018 – Shankini Doraisingam has been awarded the Silver Snoopy Award for her work with astronauts aboard the International Space Station. Doraisingam is an engineer with the University of Colorado Boulder’s Bioserve Space Technologies, a center that has designed, built and flown microgravity life science research and hardware on dozens of space missions. The award is bestowed personally by astronauts and recognizes outstanding performance contributing to flight safety and mission success. Astronaut Jack Fischer presented the award to Doraisingam at CU Boulder’s Fiske Planetarium March 2nd. He worked with her extensively during his 2017 stay on the ISS. Fischer said Bioserve plays a role in a majority of the science experiments currently being conducted on the space station and gave Doraisingam high praise for always being available to communicate with the astronauts about the experiments. Bioserve scientists and engineers communicate regularly with astronauts aboard the ISS using an uplink on the CU Boulder campus. Fischer isn’t the only astronaut with high praise for Doraisingam. His time aboard ISS overlapped with fellow astronaut Peggy Whitson. During Fischer’s presentation at Fiske, he explained that after returning from space, he met with Whitson to discuss the Silver Snoopy, only to learn they both independently wanted to award it to Doraisingam. The Silver Snoopy Award was created by NASA in 1968 as a way to spread awareness of the major impact of ground employees and contractors to the success of space missions. The award is a sterling silver Snoopy lapel pin that has flown in space, plus a certificate of appreciation and commendation letter. The pin is an original design by Peanuts creator Charles Schultz.